Volvo-Penta has released its new Battery Management System – bringing simplicity and ease of use for vessels owners all at the touch of a button. The modular system monitors, remotely controls and manages power supply from the boat’s battery groups. The system is able to be installed with the Volvo Penta’s Electronic Vessel Control (EVC) system or as Stand-alone system, non EVC. The system consists of four components; the Battery Control Module (BCM), 2.5” Battery Management Display, Battery Sensor and the e-Key Remote. For boat builders and marine technicians, less components significantly simplifies the electrical installation as much less components are needed. Features and benefits include; battery status, warnings and diagnostics integrated in one display. Single-source of information for easier fault finding. Cross-over battery function to ensure power on start up. Designed with car-like functionality, the e-Key allows vessel users to remotely switch power on or off, and – via two programmable buttons – control functions such as exterior lighting, heating or media equipment from the dockside. The Volvo Penta Battery Management System will be on display for the first time at the Hutchwilco New Zealand Boat Show, May 18-21. 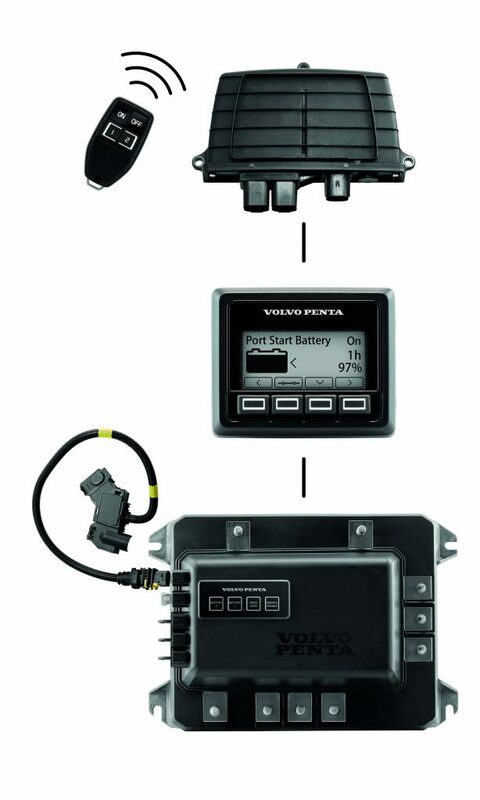 Volvo-Penta’s new Battery Management System – brings simplicity and ease of use for vessels owners all at the touch of a button.